Atea is a steel hulled Ganley Solution, 50ft overall and 44ft on deck. She is cutter rigged, with a deep centre cockpit. Dennis Ganley was a renowned NZ designer of steel hulled cruising boats, and Atea was professionally built in NZ in 1996. She spent the first thirteen years of her life being prepared for offshore cruising by her first owner, and has redundancy built into as many of the systems as possible – four battery banks, dual steering motors, fuel filters, water pumps, and voltage convertors. We carry spares for many other systems. She has standing headroom in the engine room which has a workbench, and we carry a variety of power tools for the onboard repair work that is a continual part of offshore cruising. Atea carries 850 litres of fuel for the 50HP engine, which gives us a range of close to 1000 miles under power. She has 1400 litres of fresh water which is enough for a month of casual usage, and an engine-driven water maker tops up these tanks with limitless fresh water for washing babies and water toys. 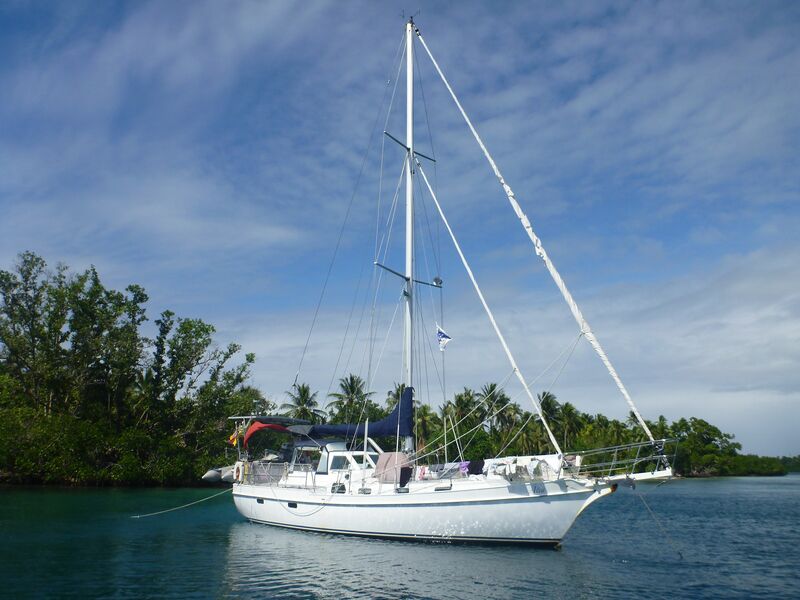 Sadly the first owner never found the time to test her offshore capabilities and we had a few ‘teething troubles’ on the first season (see ‘All for a $5 washer’), but we are very happy with Atea and she is proving to be a strong, safe and comfortable offshore cruiser.